In January I started working at a new library. One of the best things about this branch is the amount of display space I have for highlighting our children’s collection. But this also means I’ve been spending a lot of time whipping up posters and scouring the internet for display ideas. To get myself more organized I finally sat down and created a calendar filled with a year’s worth of display ideas. This calendar reflects both my city (Vancouver) and my country (Canada), so not all the ideas will be applicable to everyone. With that said, sometimes I’m lenient on the “National” marker and included some U.S. special days. I also only listed ideas if I think I have enough material in my collection to fill (and refill) a display that will last at least a week. So unfortunately things like National Donut Day didn’t make the cut. Lastly, I didn’t include generic displays that can be put up anytime of the year. I’d love to hear your display secrets! Did I miss any ideas your community loves? Please leave me a comment with your suggestions. 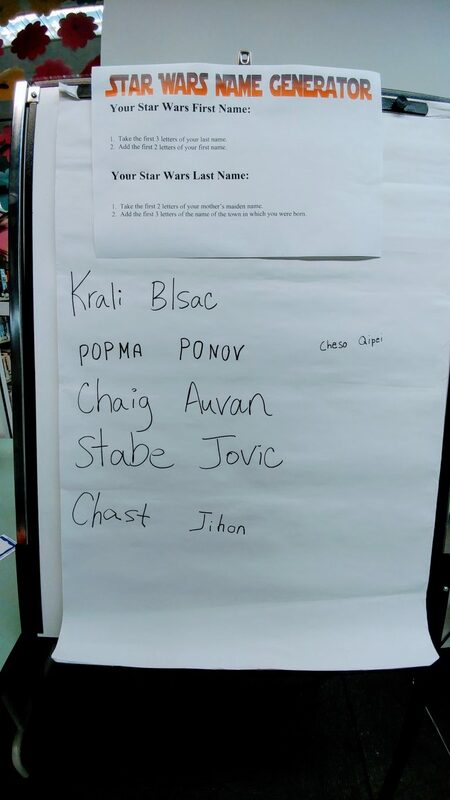 Last year I wrote about the Star Wars Day program I held on May the 4th. 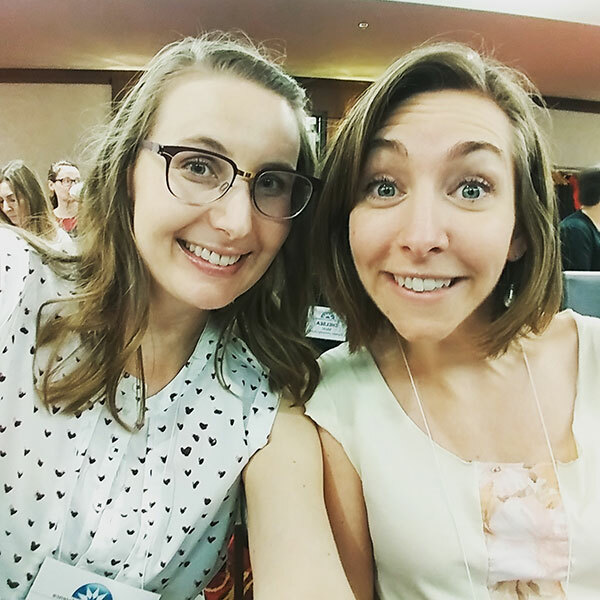 It’s been such a popular post that I thought I’d share some new activities I tried this year. But first I’d like to give a shout out to the the youth services community on Twitter. You all rock my world and give me so many ideas when my brain is tired and Google is either overwhelming or not cutting it. This one’s for you. I kept this activity from last year. This year though I did have name tags they could wear around too! My friend Kim who blogs at Literary Commentary shared this idea with me. It was so easy and so fun! 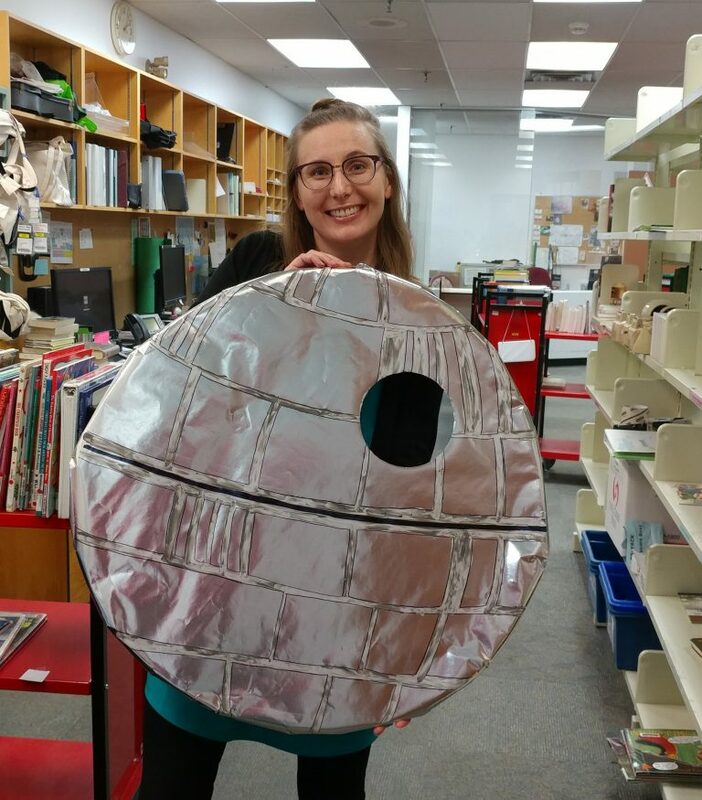 Get a hula hoop, cover it with silver wrapping, cut out a hole in the corner, then decorate it to look like the death star. I used sharpies and paint. Hang the death star using a piece of string and have kids try to fly paper airplanes through the hole. I put lines on the floor using tape with an easy, medium, and difficult distance away from the death star. A Portuguese kid on YouTube taught me how to make these. I love the internet. You can watch his video here. In the description box below the video there is a link to the templates for each of these characters: Chewbacca, Yoda, Princess Leia, and Kylo Ren. You start with a super simple base. The kids were able to pick this up quick. Then colour the other pieces and glue them on. For this activity you will need the templates, scissors, coloured pencils, and glue sticks. 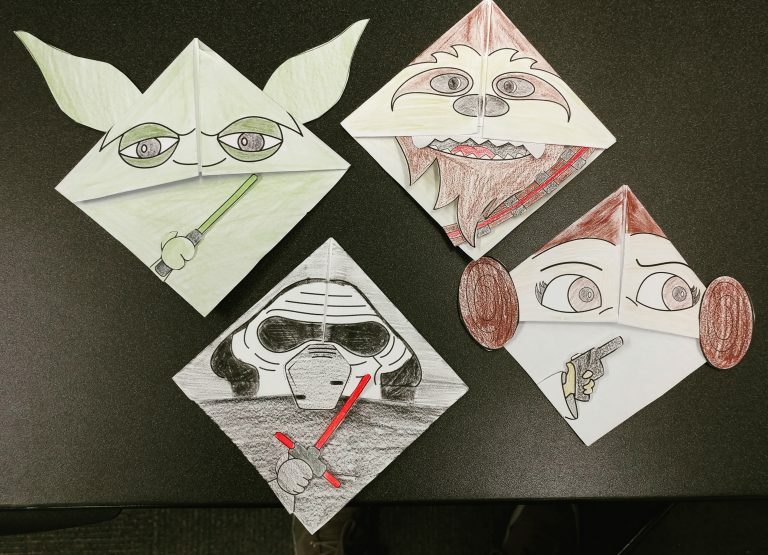 I also had some green paper for kids to make Origami Yodas. Anyone else have to program on a tight budget? I would have loved to send every kid home with their own pool noodle lightsaber, but I can’t with the money I’ve got. This idea came from the brilliant Karissa who blogs at Ontarian Librarian. 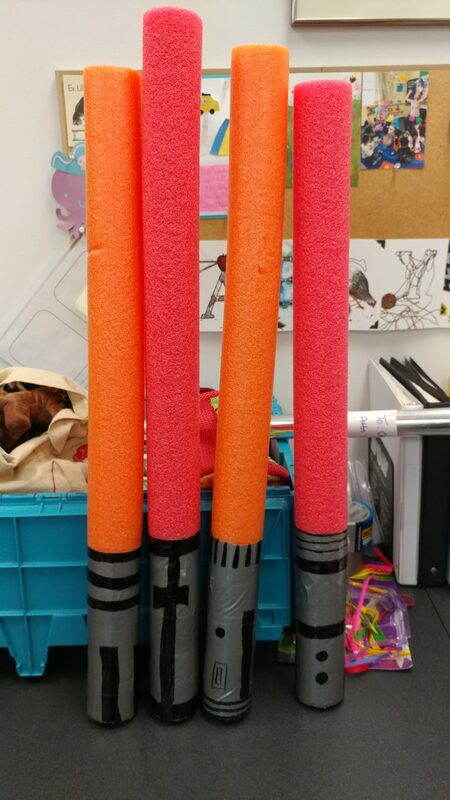 I bought two pool noodles, cut them in half and created four lightsabers using duct tape and black sharpies. In the meeting room I made two large circles with masking tape. In one circle, two kids a time faced off to see how many bubbles they can pop using the lightsabers. You can have another kid blowing the bubbles or use a bubble machine if you already have one. Have a big group? Assign some kids to be bubble counters as the duelers pop them. In the other circle each kid picked a balloon. On the count of three I threw their balloons in the air and they had to try to knock their opponent’s balloon out of the circle using their lightsaber. You can do multiple rounds for this one. Put up a sign. Put out some LEGO. Have kids show off their creations at the end of the program. Easy peasy. Shout out to Kary who shared this idea with me! In the children’s area I also put out the scavenger hunt I used last year. You can find the printable template in my other post. 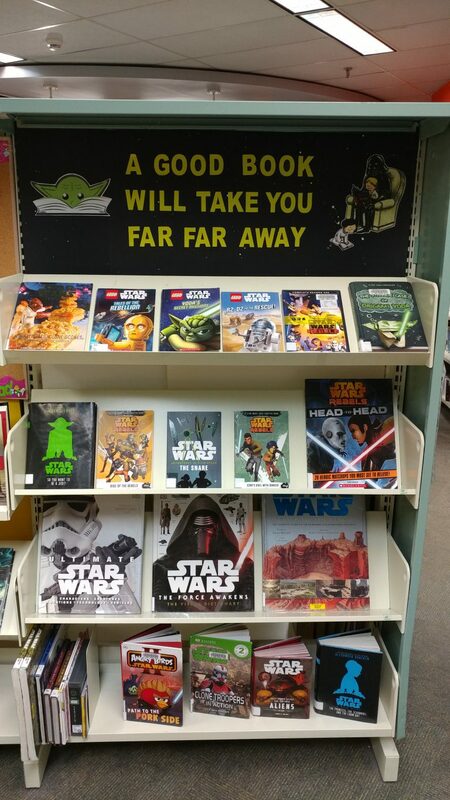 I kept this out all week next to our May the 4th Be With You book display to promote the program. Other ideas I didn’t do but am saving for next year are a Stormtrooper egg relay race (just Google it), a Force experiment, and a Jedi Mind test (put a bunch of objects out, have kids try to memorize them, cover them up, and see which ones they remember).